Hey Hey, it’s 17 May! I’ve been on a bit of a blogging hiatus recently, which has been due to a perfect storm of holidays (yay!) sandwiched in between busy days at work (boo! ), and an increasing busy social life as finally summer appears to be creaking into action. We’ve been tantalised by soft, warm days only to have the frost reappear and slap us on the face as a reminder not to take the good times for granted. Anyway, I’m back and, confirming the old saying that travel broadens the mind, I also have a few new sources of inspiration that should be popping up over the next month or so. That said, I’m going to go back to my occasional series on Norwegian goodies. I’ve got some good Norwegian friends, and usually make something in honour of their national day. For today is 17 May, and that means today is the day that the good folk of Norway like to make sure that you know, just in case there is the slightest smidgen of doubt, that they are extremely, utterly, passionately exited and proud about being Norwegian, rather than Swedish or Danish. That also means they go big in terms of food, drink, partying and flags. I’ve joined in one of those celebrations in Oslo a few years ago, and its tremendous fun. Thousands of people are wearing traditional costume, and it’s very strange to ride the metro in a modern city surrounded by people dressed as simple country folk from a rural idyll. Yes, a bottle of wine is eye-wateringly expensive, but the city is lovely, the people are outgoing and welcoming and the food is fantastic, in particular the traditional baking. In previous years, I have made lefse (potato flatbreads) and marvposteier (almond tartlets). This year, it’s really a repurposed Christmas recipe called kingler (Norwegians – is this the correct plural spelling?). 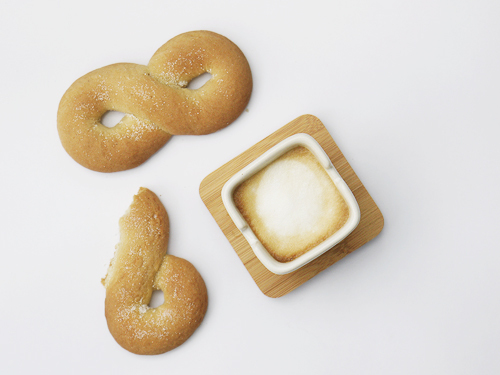 These are rich, buttery pastries that are shaped into loops, and then formed into a figure of eight shape (or the infinity symbol if you prefer). The traditional flavouring is vanilla, which goes well with the butter and cream that make these a real treat. You could go traditional, but I’ve tweaked them by keeping the vanilla, but I’ve also added a dash of freshly-ground cardamom. This is rapidly becoming one of my favourite spices, very popular in Nordic baking, and absolutely delicious in baked goods. It adds freshness and a delicate aroma, and takes these from being delicious to being something quite special indeed. While they look a little complex to make, there is an easy trick. 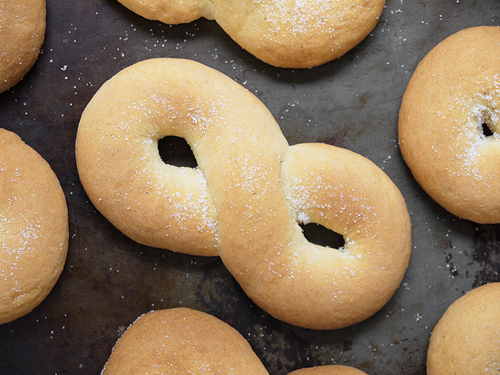 You form the dough into balls, roll it into long strips, then join the ends to make a loop. Then twist two sides in opposite directions, and there you have it – the figure of eight shape, and if you’re been cunning, the seam is hidden where the pieces of dough overlap. 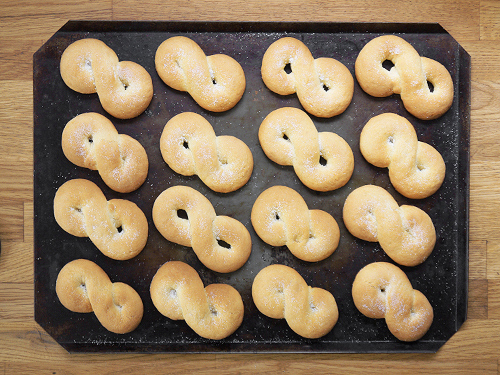 One little trick to think about is how big you make them – you actually want a thin strip of dough, and as large a loop as possible – the closer things are, the greater the chance that the loops will close during baking. This isn’t a problem, as they still have a charming S-shape, but if you’re making loops, you want loops. 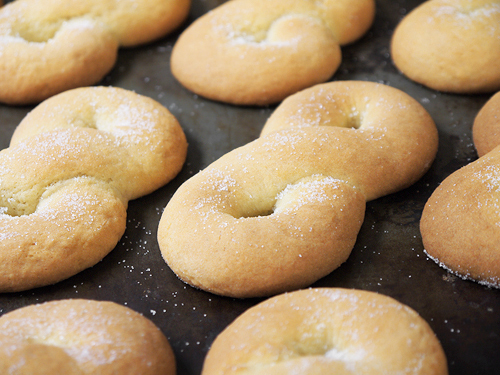 The texture of kringler is interesting – it’s not quite a biscuit, it’s softer and lighter, and more like a scone. You could certainly serve them with butter and jam if that’s your thing, but I think the best way to eat them is to enjoy their pared-back Norwegian elegance by munching on a couple alongside a cup of coffee. They are wonderful while still slightly warm, when you can enjoy them in all their buttery, cardamom-perfumed glory. To so all the Norwegians out there – gratulerer med nasjonaldagen! 1. Cream the butter until soft, then add the sugar and beat until light and fluffy. Add the egg, vanilla and cardamom and whip until thoroughly combined. 2. Combine the milk and cream in a bowl and mix well. 3. Put the baking powder into the main bowl, and add the flour and the milk mixture to the butter/sugar mixture, a little at a time, and mix until you have a smooth dough. It will be firm but sticky, so don’t be tempted to add more flour unless essential. Cover the bowl in cling film and chill for at least 4 hours (or cheat – 30 minutes in the freezer, the two in the fridge) or overnight. 4. Preheat the oven to 200°C (400°F). Line some baking trays with greaseproof paper. 5. Take lumps of the dough and form into rough balls (about the size of a walnut – a tablespoon worked for me as a guide measure). As the dough is sticky, don’t worry about getting them smooth at this stage. 6. Once all the dough is in balls, lightly sprinkle the worktop with a little plain flour (as little as you can get away with). Start to roll the balls into long strips, adding a dash flour as needed, until they are around 20cm long (the strands might seem very thin, but they will expand in the oven – and the bigger the loops, the more defined the shape will be). Join the ends to make a loop, and then twist in opposite directions so you have a figure of eight shape. Try to have the pieces cross on top of the join for a neat finish. Put on the baking sheet. Repeat until all the dough is used up. 7. Bake the kringler for 10-15 minutes until an even golden brown colour (turning half-way if needed). Remove from the oven, sprinkle with a little caster sugar, if desired, and enjoy either warm or cooled with coffee. Worth making? This is an incredibly easy recipe, and ideal if you need something to serve fresh from the oven – the dough can be made the night before, and the kringler shaped and left (covered in cling film) until baking. The inclusion of the cardamom makes them extra-special and a little usual with your morning coffee.